Kuroko no Basket also has a series of light novels, audio CDs, and several games for the Nintendo 3DS. Kuroko also appears in the crossover fighting game J-Stars Victory VS.
Side story: Kuroko no Basket: Oshaberi Shiyokka, Kuroko no Basket: Baka ja Katenai no yo! The most common criticism I've seen so far of Kuroko no Basket has been how unrealistic it is. I myself am an avid basketball fan who plays regularly and watches NBA games. I can understand the criticism as this anime has a lot of spectacular dunks, blocks and flashy passes, the stuff you usually only see in highlight reels, but occurs regularly throughout the games in here. There's also the shounen elements with the special powers of Generation of Miracles members and other things such as the "martial arts" Seiho employs. That being said, I am completely ok with this. Why? Because it makes it interesting. Think about it. As a basketball fan, it'd be great to see the teams run plays like the triangle or pick and roll, but you can't expect the average viewer to understand what's going on. Plus, trying to explain this and other technical terms would eat up screen time and bore a lot of viewers. This is first and foremost entertainment. Kuroko no Basket is great to watch BECAUSE of these elements. Watching Kagami slam the ball down or Kuruko go ninja and make a flashy pass is far more exciting than watching a player hit an open jumpshot from good ball movement. It's the same reason why many people label the Spurs in the NBA as "boring" despite their well-oiled offense. If you really wanted realistic basketball, you'd watch an actual game. What Kuroko no Basket excels at doing is showing how exciting basketball can be to a mainstream audience. I have yet to be disappointed by any of the episodes, as they have all left me with a big, goofy grin on my face from the thrilling games or cliffhangers at the end of each episode. 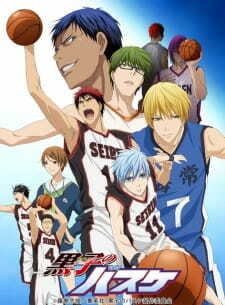 Look around and you'll see that many viewers are not basketball fans, but love this anime. This is great because it's garnering interest in basketball in people that would have never noticed the sport were it not for this anime. This is especially true in Japan, where basketball is nowhere near as popular as sports such as baseball or football(soccer). As for the anime itself, it captures your attention with epic scenes, likeable characters, and funny comedy. Kuroko's sudden appearances that startle every character out there is a running gag, opponents with names like "Papa" and Kagami's Engrish "THIS IS JAPANESE LUNCH TIME RUSH!" keeps things interesting. The story is your classic sports anime, with the Seiren basketball team aiming for the top. However, if you were expecting some athletic, hot-headed knucklehead who excels in the sport...well, that's the deuteragonist Kagami. Kuroko is the protagonist here, and he's an unconventional lead for a sports anime. He's terrible at almost every aspect of basketball except passing and stealing. Together, he and Kagami form a exciting duo to watch reminiscent of real-world duos such as Stockton and Malone. The other characters aren't explored too much and I was afraid the other Seiren members would just become useless bodies, but slowly we've been introduced to their own unique skills. The only other characters that the anime really delves into are the members of the Generation of Miracles, who are all distinguished by their special powers and...colorful hair, Kuroko included. Here is where the shounen aspect of the show is most visible, with the members displaying everything from behind the backboard shots to full court shooting range (though I have to admit that's really pushing it). They are the equivalent of the boss characters you see in other shounen anime, as Kuroko, Kagami, and the Seiren team must find a way to overcome them. The art and animation are pretty good, however, animation isn't as consistently fluid as I would've liked. The movement of players shooting or passing the ball feels too rigid or unnatural at times, as if they didn't draw enough frames (with the exception of Aomine's ridiculous handle). It compensates for this by having a lot of slow motion and close up shots of dunks, blocks, and steals which really help excite the viewer and make this anime so thrilling. It is definitely one of the better looking sports anime out there, which is part of what makes it so appealing to a wider audience. For the most part, the music consists of guitar-heavy tracks that come in whenever something notable happens, such as opponents being surprised by one of Kuroko's passes. The opening and ending feature rock songs that keep the same adrenaline pumping feel the anime has. The one thing that really bugs me though is how each episode starts off with a narrator introducing the Generation of Miracles story. It's understandable in the first few episodes, but past that there's no point in it, since viewers would already be familiar with the backstory (Edit: They finally stopped this nearly HALFWAY through the season). In short, Kuroko no Basket is an entertaining anime to watch, even if you don't like basketball. The thrilling games will capture your interest and many can relate to the story of going for the top and exceeding expectations, as the underdog Seiren team does time and again. Don't go into Kuroko no Basket expecting expertly executed plays like in real basketball. Don't go into it thinking you'll see a mirror image of a real game in anime form. Go into it expecting a thrilling game of dunks, blocks, and crazy passes, a lot of O.O faces from the characters, and competitive trash talking. Watch it for the determined characters, comedy, and overcoming special powers we've come to love in shounen anime. It doesn't portray basketball too realistically, but realism in this case would only drag a fun anime like this down. Let me start by telling you that I'm 29 years old, and when I was 6 years old, I fell in love with an anime called Captain Tsubasa, not only because I am Portuguese and we generally love football, but because when you're at that age, everything is magical, you want to do the shots they do, you want to be Tsubasa Ozora on the field. I've seen many sports anime after it, and none were good enough to create the impact that Captain Tsubasa caused on me, there were a few that I loved such as Miracle Giants Dome-Kun! and Ganbare! Kickers, but Captain Tsubasa would always have a special place in my heart. To all the sports anime fans that grew up with this style of Shounen, the anime with the potential to dethrone the generally accepted king is finally here. The story is just what you expect from a sports anime, it's unrealistic? It's an anime. How many anime about sports are realistic? hell, other than slice of life how many anime about anything are realistic? and is that really what you are looking for when you're watching anime? realism? the answer is obviously no. Despite all that, whoever wrote the anime and drawn the moves definitely knows his basketball since some of the plays are copy/paste from some of the greatest dunks, three-pointers or behind the hoop shots in real life, they know their technical therms, they know how basket works, and they made a damn good anime about it. The generation of miracles is exactly what they said it is, miracles, players that usually are born in the united states, once every other decade, Michael Jordan, Kobe Bryant, Lebron James... except these were born in Japan, all at the same time, and now, they're all rivals. You will love them all. The main character is not some overpowered monster that destroys everyone, no, he's very simple, you barely notice him, but you know he creates the biggest hype, and you can barely wait to see what he will be capable of in the future, but he faces hardships, real hardships, he's the underdog you like to root for. Right at the beginning of season 2, his potential will scare you. His rivals are not only his rivals, they're his friends, you will get to know them, their traits, you will appreciate the anime as much for its school and story characteristics as much as you will do for the sports component. The character development is ridiculously good, and you will get acquainted with all players from the top teams in about 25 episodes, games last 2 or 3 episodes, which is just the right amount of time, it's packed with action, it's packed with story, it has just the right amount of each! It keeps topping itself, over, and over, and over, and you get more and more excited, and not only for basketball or sports fans! No! You can like fighting anime such as Fairy Tail, Zetsuen no Tempest, Bleach, Naruto, and you won't be let down by the action of Kuroko no Basket, I guarantee it. No one would ever thought an anime about basketball could be so interesting, so filled with adrenaline and action packed, no one would ever think it could have such an amazing story, but Kuroko no Basket will prove you wrong, your heart will race, you will laugh, you will get excited, you will root for your favorite characters, and you will watch another, and another, and another, until you inevitably surrender to the awesomeness of Kuroko no Basket. As a sports anime, it gets a 10. As an overall anime, it still gets a 10 because it is that awesome! So, as I have nothing to waste, I will bring to you a review of the immensely praised show that is Kuroko no Basket. Even though it is not a very popular show (not even in the top 100), most people that have watched it are immensely positive about it, and it made me wonder why. After being encouraged to watch the show several times, I figured it was the time to do so – and I can say it delivered. I soon became one of the people “enchanted” by the show. Once upon a time, there was a basketball team that demolished each and every competition they came across: the all-star team of Teiko Junior High. The team consisted of 5 basketball players with each an astonishing amount of talent, and their own unique speciality: the Generation of Miracles After junior high school ended, the team naturally broke up – the prodigies all joined different high schools with great basketball teams. However, fairly unknown is that there was actually a 6th player which played in the all-star team of Teiko Junior High: Kuroko Tetsuya. This so called “phantom” player joined a new school, with an unknown basketball team, unlike the other prodigies. At this school, Seirin High, Kuroko meets Kagami Taiga, a natural basketball talent who has just returned from America (where he had lived for some years). Together, they are aiming to beat the generation of miracles, and become the strongest in Japan. Overall it’s just a very solid storyline, which is able to keep the viewer interested over the course of episodes, but it’s not stunning either. It isn’t a very complex storyline which leaves the viewer thinking, but rather a very simple storyline which is enjoyable to watch. The show does not have much filler, yet is not too serious either – this was a huge plus to me. It was a very refreshing watch; a show I could really enjoy without putting too much thought into it. The pace is very good, as I found myself blowing through episodes one after another. However, I was a little disappointed at the predictability of some (or maybe most) of the matches, and the story as a whole. But that does not take away the fact that the story is very enjoyable. Most people that dislike KnB do so because of its unrealism – but I don’t agree on that. It’s the unique abilities and unrealistic shots that keep the viewer thrilled. I think the majority of the people would not like watching very plain basketball games as seen in real life. In short, Kuroko no Basket features a simple, yet very enjoyable story. Nothing astonishing here, nothing bad either. It is not a visual masterpiece, but some episodes really had a nice atmosphere to them due to the excellent animation in them. The drawing style is nothing to complain about either. Overall, I’d say that given the budget, they did a great job on the art: it is more than decent. Sound is one of the aspects in which KnB really shines. The openings and endings are very good (and fitting), but even more impressive is the soundtrack during the episodes. They really manage to enhance the atmosphere of the matches and make episodes more thrilling than they already are. The sound acting is very well done as well – the sound as a whole is just excellent. As for the characters, logically, the biggest focus is on Kuroko and Kagami. They are thoroughly described, and made to be very likeable: they both have characterising traits which perfectly fit their basketball abilities. The 5 “Prodigies” are very well done too – as far as the ones we get to know in season 1. Furthermore, we get to know a variety of characters in the high school basketball scene. While they weren’t all given the necessary description (for example, I think the other players in Seirin could have gotten more of a backstory), they were still decent enough to fulfil their roles. I honestly enjoyed Kuroko no Basket as much as I was told I would. While the show definitely has some flaws and is not nearly as enthralling or well thought out as others (I’m looking at you, Fate/Zero, Steins;Gate), it still turned out to be a great source of enjoyment. The matches actually did manage to keep me on the edge of my seat, and managed to get me to play basketball myself! It made me want to try those fascinating shots in real life, and got me to look up more about basketball as well. In short, if you are looking for a refreshing (perhaps simple) anime, or just really like sports shows, then you should certainly give this show a watch – because that’s what Kuroko no Basket has to offer. Short Overall: Thoroughly enjoying, dynamic and engaging, and possesses characters that you will undoubtedly grow to love. Fantastic soundtrack to accompany somewhat seamless scenes, along with great visuals. Although it doesn't have a complicated plot with unexpected twists, Kuroko no Basket gives so much more than just your average sports series. Previously, Kuroko no Basket had appeared in numerous threads and places whenever i was searching for something new to delve into. As a non-sports fan myself, i wasn't interested in this series until i read the reviews for it. Many of the people's comments stated that although they didn't like sports themselves, they found themselves enjoying the series thoroughly. So, why not try it out? Characters: Over the 25 episodes, you're introduced to a wide array of characters that each possesses their own unique quality. They were all very likable, even if a few seemed difficult. The majority of them were given back stories that informed the viewer of their past, which was good for character development. Perhaps i would have liked to see a more thorough explanation of a few of the character's background. Sound: One of the things i liked best about this series was the soundtrack. They were inputted perfectly and in the right scenes to give that bit an extra "oomph". Alongside this, there was a nice variety of different compositions to emphasize the atmosphere of the scene at the time. I especially loved the song near the end of the series, at the end of the last basketball match. Art: The visuals were nothing special, nothing of say, a Shinkai masterpiece, but it was nevertheless pleasing to the eye. During some episodes the quality did fall slightly, but my best guess was that it was due to budget. Some of the animation in the scenes were brilliant, and made the movement of the characters seem much more fluent. Story: As i said previously, this show does not contain many serious twists and plot changes that will have the viewer sitting on the edges of their seats. That being said, i fully believe that it doesn't need twists to be a brilliant series. The enjoyment i got from this series was not because the storyline was complex, but because it was easy to follow and easy to enjoy. Everything was explained smoothly, and very few plot holes were left. Enjoyment: I was surprised - incredibly surprised- at how much i ended up loving this series. It was hilarious, exciting and really fun to watch and to engage yourself into. I ended up loving the characters and sympathizing with each of them. Kuroko no Basket is an engaging anime, and is one of the few i genuinely re-watch. It goes on my top 5. You know that one male character in every anime who's always losing his shirt and attracting females with pink hearts as their eyes? There are 20 of them here and they're as hot as ever! An anime dog is a protagonist's best friend. Anime dogs play different kinds of roles in different anime series. Not only are they loyal to their masters, they also fetch the hearts of anime fans alike! Come find the pick of the litter in this collection of adorable anime pooches!